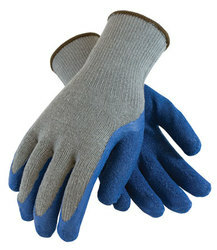 G-Tek® , grey cotton/polyester with blue latex crinkle finish coated on palm, finger tips and full thumb, regular grade. • Latex rubber coated palm and finger tips; • Seamless gray cotton/polyester liner; • Unique "crinkle" finish for superior grip in wet and dry applications; • Ergonomic shaped curved finger pattern; • Uncoated back allows hand to breathe. Applications: Ideal for assembly, construction, inspection, material handling, refuse handling, landscaping and gardening. Recommend washing gloves in slightly warm water not exceeding 40o C. A mild non-ionic detergent should be used. A 5-10 minute cycle time should be employed. Hang dry; tumble dry is not recommended.